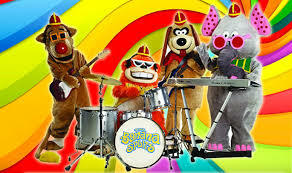 1970s TV stars “The Banana Splits” have been banned from attending Aussie rules games after fears that morons may hurl band members at indigenous players. “It’s a shame that the actions of a few idiots are giving our game a bad image,” said Collingwood president Eddie Maguire. It’s not known if Maguire was referring to the idiot who threw the banana in Adelaide or the concerned fans who filmed the incident and put it out on social media. This will not be the first time that a Sid and Marty Krofft character has been banned from the AFL. Security had to eject a drunk H.R. Puf’n’stuf from Etihad stadium after hitting a witch with a magic flute during a St Kilda game in 2011.